After a successful Family Fun Day debut last year and two years of boot stomping music & craic at the Hoedown in Lobinstown, both events return to the Meade Potato Company farm and food production facility in Lobinstown, Co. Meath on Sat. 5th Aug. and Sun. 6th Aug. for a farm festival weekend not to be missed. All this good old fashioned fun is in aid of the local schools Heronstown N.S. and Newtown N.S. (Family Fun Day) and the local GAA (Hoedown in Lobinstown). On Saturday 5th Aug. from noon to 3pm, children can dance to country tunes, enter the mini tractor grand prix, take a pony ride, have a bounce on a selection of bouncy castles, get their faces painted, enjoy the farm animals, kick hot shots and take a tour of the farm and food production facility to learn more about the farm to fork journey of fresh produce. Admission is €5 per child and includes all of the above activities, and free entries into a draw to win an annual family membership pass for Tayto Park. A BBQ stand and ice cream van will also offer families great value to make this a fun day that’s easy on the pocket but high in the fun stakes for all the family. The car park opens at 11:30am so get there early is the advice to ensure you enjoy every minute of the farm fun that’s on offer this bank holiday weekend. Adults are catered for the following night starting from 8pm at the Hoedown in Lobinstown which will feature music by the Texas Wildcats with special guest star Eugene Donegan – Pilgrim St. and Paddy McGarry. The Meade potato store will be transformed into a bona fide barn dance venue complete with a saloon offering happy hour specials and good value all night. There will be prizes for the Best Dressed Cowgirl and Best Dressed Cowboy as well as a jiving competition for those twinkle toes that fancy their chances. A night not to be missed for all ages over 18. Admission of €25 includes great music and a pig roast BBQ by Callaghan Butchers Ardee. Tickets for the Hoedown are available at Lobinstown Post Office, Kevin Flanagan Butchers, Watters Pub Collon, Lobinstown Inn, The Sally Pub Rathkenny, Donoghue's Pub Woodtown, Meade Potato Company, PS Supplies Lobinstown, Callaghans Butchers Ardee and all Syddan GFC and Dee Rangers LGFA players and committee members. “Based on the huge amount of positive feedback and fun we had facilitating both events last year, it will be a Bank Holiday weekend not to be missed here on our farm in Lobinstown,” states Eleanor Meade of Meade Potato Company. Both events have ample parking available and will take place rain, hail or shine! For more information, please see facebook: Meade Potato Company or Hoedown in Lobinstown for more updates. The Family Fun Day on the Farm, held from 12-3pm on Sat. 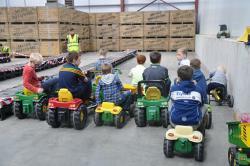 5th Aug. at the Meade Potato Company Farm in Lobinstown, Co. Meath offers a variety of activities for children including a Mini Tractor Grand Prix. Admission €5 includes all activities as well as a raffle ticket for an Annual Family Membership to Tayto Park. All proceeds go to benefit local schools. Starting at 8pm on Sun 6th Aug at the Meade Potato Company Farm in Lobinstown, Co. Meath, the Hoedown in Lobinstown welcomes Eugene Donegan-Pilgrim St. and Paddy McGarry as Special Guests and will feature the Texas Wildcats. 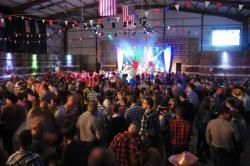 Last year’s packed event transformed a potato store into a boot stompin’ Texas honky tonk. Admission €25 includes BBQ dinner. Our Employee Recognition Awards for Spring took place last week and we had 3 finalists in the Potato & Peeling Division: Terence Gilsenan, Laima Bendaraviciene and Malgorzata Kopec. Malgorzata was our overall winner (pictured top below with Robert & Tommy). In the Fruit & Veg Division the finalists were: Tomas Korsakas, Tomasz Smardzewski and Elena Acsinte who was the Overall Winner. She is pictured bottom below with Stephen, Daragh & Patrick. 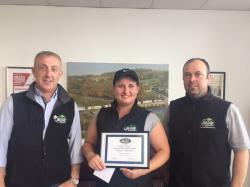 Malgorzata Kopec, Winner of the Potato Division Employee Recognition Awards for Jan-april 2017 pictured with Robert Devlin and Tommy Clarke. 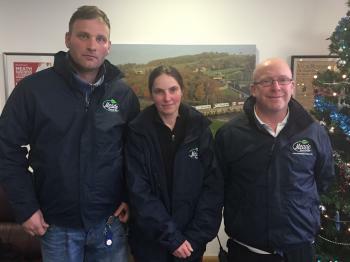 Elena Acsinte who was the Overall Winner is pictured with Stephen Husband, Daragh Carolan & Patrick Meade. 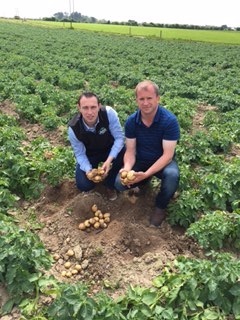 Philip Meade Jr. and Jonathon Fahy headed down to the sunny southeast recently to meet up with the growers who specialise in producing Ireland's finest New Season Potatoes for us. 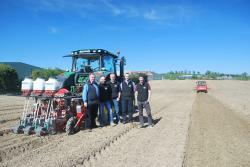 Having met with James, Eamon, Tom and Simon, they are looking forward to another premium quality crop. 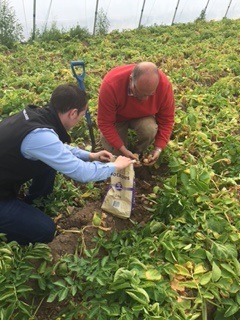 The Wexford soil is ideal for these early potatoes and this, combined with the expertise that these growers bring to their crops, means that our New Season potatoes will be as tasty as ever - a real treat for spud connoisseurs waiting to tuck in to the new season. 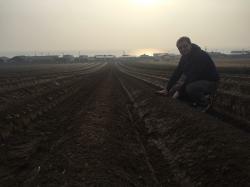 Our Farm Manager Conor O'Malley and our team of growers have been busy this past month planting potatoes and carrots. Now the hard work of monitoring and nurturing the crops begins. 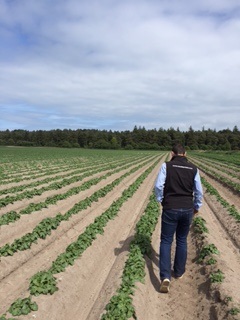 The early potatoes will be harvested in June, the carrots in July and the main crop potatoes in late August. 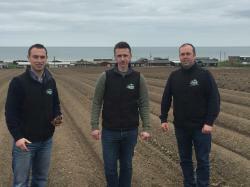 Philip Meade Sr., Mark McKenna, Robert Devlin, Patrick Meade and Roy White nip out of the office to inspect the recent carrot plantings at our farm and food production facility. 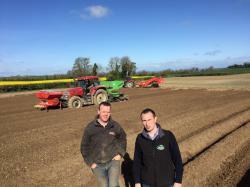 The planting team out in full force planting main crop Roosters in Lobinstown. 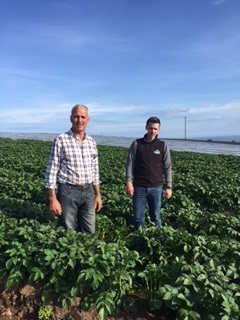 Brendan and Philip Jr. outside of Ardee planting potatoes for harvesting in Sept.
Philip Jr., Jonathon and Tommy visit the seaside to check ont he recent plating of our Queen crop in Clogherhead. 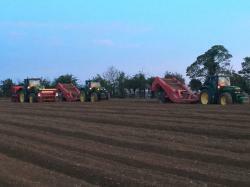 Conor finishes up the Clogherhead planting and takes one last look at the drills before he leaves for the night. The agri-food educational body Agri Aware signalled the start of spring by launching the primary school healthy eating initiative Incredible Edibles with the help of the students of St. Phillips NS, Clonsilla, Dublin 15. They have received a great response with 46% of all national schools signed up to the programme which encourages schools across the country to grow their own strawberries, potatoes, carrots, lettuce, turnips and herbs by supplying packs containing everything they need to become growers. Compost and seeds are sent out, while classroom curriculum-linked activity sheets, log books, growing planners and growing videos can be downloaded from the Incredible Edibles website. By the end of the schoolyear students enjoy the fruits of their labour with early season spuds, tasty strawberries and fresh carrots among the produce to be enjoyed. Eleanor Meade of Meade Potato Company, a sponsor of the programme, joined other sponsors and supporters from the IFA, Bord Bia, the Department of Agriculture, Healthy Ireland, the Department of Education and Agri Aware to watch as the inaugural group of students got digging. This hands-on approach to growing produce and educating students about nutrition will hopefully encourage young people to eat their seven plus a day of fruit and vegetables. “With the importance of healthy eating being such a vital lesson for children to learn, we are delighted to be long-time sponsors of this programme. It gives children an insight into how fruit and vegetables are grown, and why they are so nutritious; the sense of accomplishment and fun in watching their gardens grow is a real draw for students. They learn to appreciate the hard work that goes into producing food. This should ultimately help students appreciate agriculture and sustainability as they get older. It’s a win/win programme on all fronts: healthy eating, agriculture, science and the environment. If your local school hasn’t registered, it’s time to get online and get growing,” commented Eleanor Meade of Meade Potato Company. You can find out more information online at www.incredibleedibles.ie. Entries are closed for this year, but make sure to mark your calendar for next year. 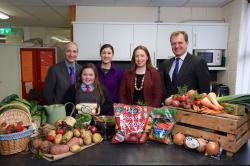 Pictured left to right at the Incredible Edibles launch at St. Phillips NS, Clonsilla, Dublin 15 are: Mike Neary, Bord Bia; the St. Phllips NS student rep; Deirdre O’Shea, Agri Aware; Eleanor Meade, Meade Potato Co. and Richard Moeran, AgriAware, all ready to start their planting. The 6th Meath Spring Half Marathon & 10k which incorporated the 44th Rennicks Cup & 41st Fr Delany cup & the Meath Half Harathon Championship was held by Bohermeen AC on March 19th. The event has grown into one of the most popular events in Ireland; people made the journey from 28 counties of Ireland to the event, which is a highlight of the athletics calendar. Meade Potato Co. were happy to join in by demonstrating our commitment to promoting a healthy lifestyle and healthy eating through our sponsorship of fruit for the third year running. After Tony picked up the fruit, the younger members of the club joined in the packing of the goody bags. On Friday 10th March Level 6 Health Care Supervision students, along with their Health Promotion Tutor, Patrice Byrne, organised a Healthy Eating Event in the college. The aim of the health promotion event was to encourage students to incorporate healthy eating options into their diet in an effort to improve their overall health and wellbeing. 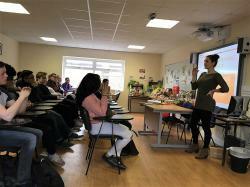 Grainne Whelehan, Nutritionist, kindly agreed to come and speak with the students and gave a very entertaining presentation on nutrition and healthy eating. We were joined by Avonmore/Glanbia, Brennan’s Bread, Fyffes, Gempack/Sowan’s Food Products, Glenisk Yogurts and Irish Pride in showcasing the benefits of Ireland's healthy foods. Meade Potato Company were delighted to hear that the produce we have donated to the Crosscare community foodbank has gone towards making 70,000 meals for people in need in 2016. 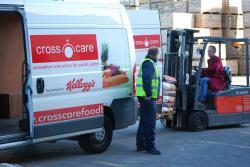 The potatoes, carrots and other fruit and vegetables that we give the Crosscare foobank every week are re-distributed to people who are in need of some support in meeting their weekly food supply. 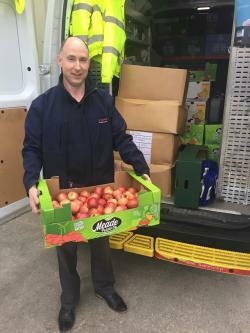 Our produce donations to foodcloud, another leading community foodbank in Dublin, for the period from Oct-Dec 2016 helped to make 15,180 meals for people in need. Foodcloud successfully re-distributed 6.9 tonnes of surplus food and thereby saved 8.1 tonnes of CO2 emissions. Our commitment to channelling surplus food to community foodbanks is a pillar of our sustainability plan, and one which we believe reaps high rewards. We rounded out an excellent year on Dec. 23 by honouring the hard work of all of our teams at our annual Christmas awards gathering. While narrowing an award down to one winner is always difficult with a staff who are all hard working, we singled out five candidates who deserved special recognition. 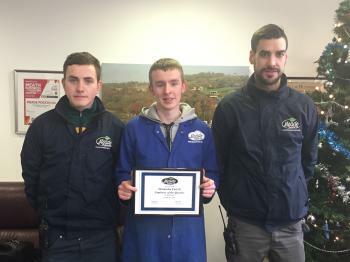 Winning the Employee of the Quarter Award in the Vegetable Division was Donnacha Farrell whose attention to detail and conscientiousness are a great asset to the team. Simas Silianskas won the Employee of the Year for his efficiency with our IT systems and his industriousness in the dispatch department. 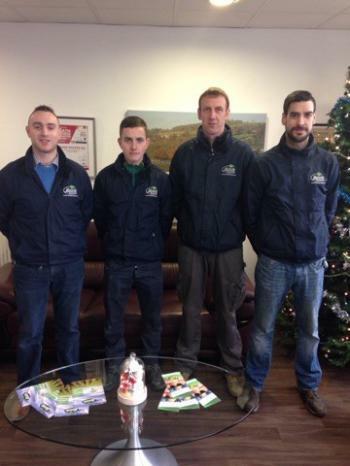 Pictured below left is Donnacha Farrell with Mark and Peter, and pictured below right is Simas with Patrick, Mark and Peter. We were able to do a joint presentation as the Employee of the Quarter and Employee of the Year were won by the same person in the Fruit Division. Daiva Dziaugyte has been a real champion of recent IT improvements. She has been brilliant at helping the team to implement these upgrades. 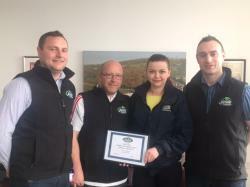 Here she is pictured with Ronan, Darragh and Patrick. While celebrating the hard work of our entire team in the Potato Division, Rory Young nabbed the Employee of the Quarter Award for his efficiency in the potato yard and Mantas Vaitekunas took the Potato Div. Employee of the Year Award for his incredible work ethic. 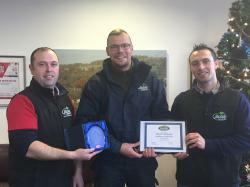 Pictured below left is Rory with Tommy and Philip Jr. Pictured below right is Mantas with Tommy and Philip Jr.
With nominations for Health & Safety, Sustainability, as well as Fruit and Vegetable Agribusiness of the Year 2016, Meade Potato Company were delighted to take home the latter award for the second year running. The Fruit and Vegetable Agribusiness of the Year is designed to provide a voice for the individuals and organisations that play a significant role in the growth and development of the agribusiness industry in Ireland. 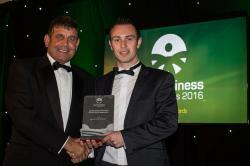 The Awards cater for all sectors who contribute to the fantastic achievements within the agri-food. A factor in Meade Potato Company's award was their best practice leadership in sustainability for the fruit and vegetable sector. 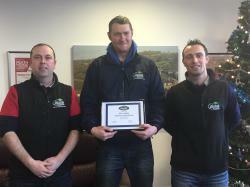 "We were honoured to be chosen for the second year in a row; it is recognition that once again ourselves and our team of growers have achieved excellent standards of practice ," said Philip Meade Jr. of the award. 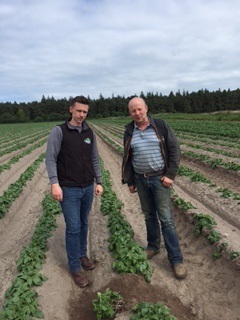 Pictured above are Minister for State for Food, Forestry & Horticulture Andrew Doyle and Philip Meade Jr. of Meade Potato Co.